Robin Youngs, Edward Fisher,	The Journal of Laryngology & Otology, Volume 128 Issue 12, p 1027. R Grewal, P M Spielmann, S E M Jones, S S M Hussain,	The Journal of Laryngology & Otology, Volume 128 Issue 12, pp 1028-1033. S P Moubayed, B L'Heureux-Lebeau, A Christopoulos, J S Sampalis, L Letourneau-Guillon, E Bissada, L Guertin, P G Harris, A M Danino, T Ayad,	The Journal of Laryngology & Otology, Volume 128 Issue 12, pp 1034-1043. S Belhassen, I Saliba,	The Journal of Laryngology & Otology, Volume 128 Issue 12, pp 1044-1049. M Malhotra, S Varshney, R Malhotra,	The Journal of Laryngology & Otology, Volume 128 Issue 12, pp 1050-1055. F Zeinali, M Mohseni, M Fadaee, Z Fattahi, H Najmabadi, H Otukesh, K Kahrizi,	The Journal of Laryngology & Otology, Volume 128 Issue 12, pp 1056-1059. R Bhargava, A Chakravarti,	The Journal of Laryngology & Otology, Volume 128 Issue 12, pp 1060-1066. 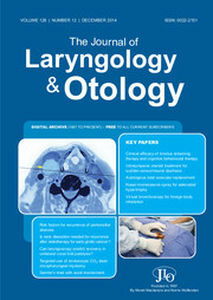 M Ozturk, F Mutlu, A Kara, S Derin, M Topdag,	The Journal of Laryngology & Otology, Volume 128 Issue 12, pp 1067-1070. J Rimmer, P Andrews, V J Lund,	The Journal of Laryngology & Otology, Volume 128 Issue 12, pp 1071-1077. G Behera, N Tripathy, Y K Maru, R K Mundra, Y Gupta, M Lodha,	The Journal of Laryngology & Otology, Volume 128 Issue 12, pp 1078-1083. J H Chung, Y C Lee, S Y Shin, Y G Eun,	The Journal of Laryngology & Otology, Volume 128 Issue 12, pp 1084-1088. Is elective neck dissection necessary in cases of laryngeal recurrence after previous radiotherapy for early glottic cancer? A Deganello, G Meccariello, B Bini, F Paiar, R Santoro, G Mannelli, O Gallo,	The Journal of Laryngology & Otology, Volume 128 Issue 12, pp 1089-1094. J K R Menon, R M Nair, S Priyanka,	The Journal of Laryngology & Otology, Volume 128 Issue 12, pp 1095-1104. N Dawe, J Patterson, D Hamilton, C Hartley,	The Journal of Laryngology & Otology, Volume 128 Issue 12, pp 1105-1110. G Dimbleby, A Mitchell-Innes, J Murphy,	The Journal of Laryngology & Otology, Volume 128 Issue 12, pp 1111-1113. P Sethukumar, R Heywood, A Narula,	The Journal of Laryngology & Otology, Volume 128 Issue 12, pp 1114-1116. D Penjor, A K Khizuan, A W Chong, K T Wong,	The Journal of Laryngology & Otology, Volume 128 Issue 12, pp 1117-1119. A Delides, E Manoli, M Papadopoulos, T Nikolopoulos,	The Journal of Laryngology & Otology, Volume 128 Issue 12, pp 1120-1122. A Patel, C Theokli,	The Journal of Laryngology & Otology, Volume 128 Issue 12, pp 1123-1124. M Hitier, V Roger, S Moreau, V Patron,	The Journal of Laryngology & Otology, Volume 128 Issue 12, p 1125.